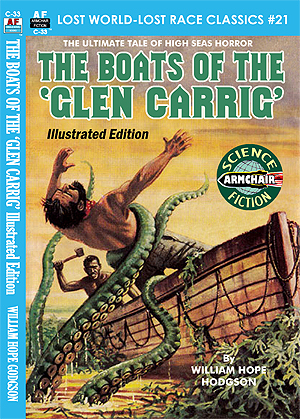 The above text is the original introduction to William Hope Hodgson’s “The Boats of the ‘Glen Carrig.’ ” This grand tale is an early classic of fantasy, horror, and adventure. It tells the story of the survivors of a ship lost at sea and their subsequent adventures into lost realms of unearthly beings and deep sea monstrosities. It is one of the strangest sea-faring horror tales ever told and was admired greatly by horror fiction legend, H. P. Lovecraft.